Handsome Hugo makes our heart melt and has proved to be a popular bear over the past few years. Hugo is multi-tonal in mocha brown with sandy brown layer and black tips. 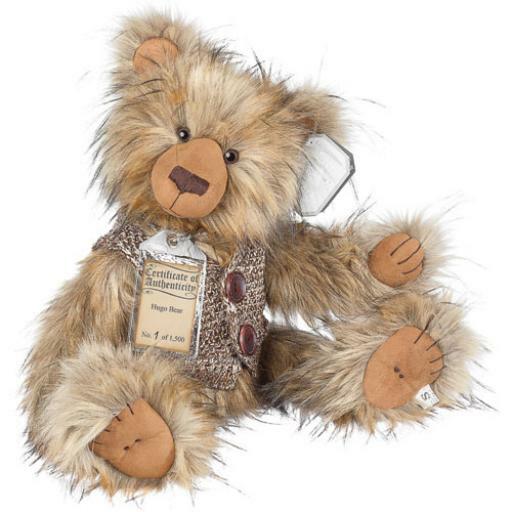 He has caramel suedette paw pads, with double dimples and brown stitching for his toes. Hugo has a caramel suedette muzzle with a dark brown stitched nose. He looks loveable and alert. Aswith all the Silver Tag bears, Hugo is fully jointed, substantiallyweighted, and has a classic hump. Hugo comes with an individually numberedCertificate of Authenticity. He is 48.3 cm standing. Hugo is one of 1500. Hecan be spot cleaned. Please be advised, limited stocks. Hugo is nearing retirement.